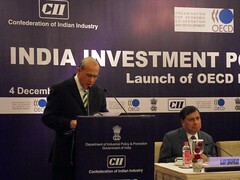 The first OECD Investment Policy Review of India was published on 4 December 2009. OECD Secretary-General Angel Gurría joined India’s Minister of Commerce and Industry, Mr. Anand Sharma, in Delhi for the Angel Gurría launches the investment policy review in Delhi. This review assesses the development of India’s investment environment on the basis of the The Policy Framework for Investment. It forms part of the continuing programme of OECD-India co-operation in the field of international investment which began in 2004 when India hosted the 4th Global Forum on International Investment: Investment for Development - Forging Partnerships.